Sweet potatoes are so much quicker to bake than regular potatoes so they’re perfect for when you want your food to just be ready fast. I give them a little head start in the microwave first before putting them into the oven to finish baking and crisp up. Our pesto veggies baked potato topping is just delicious, as well as being really quick to make. 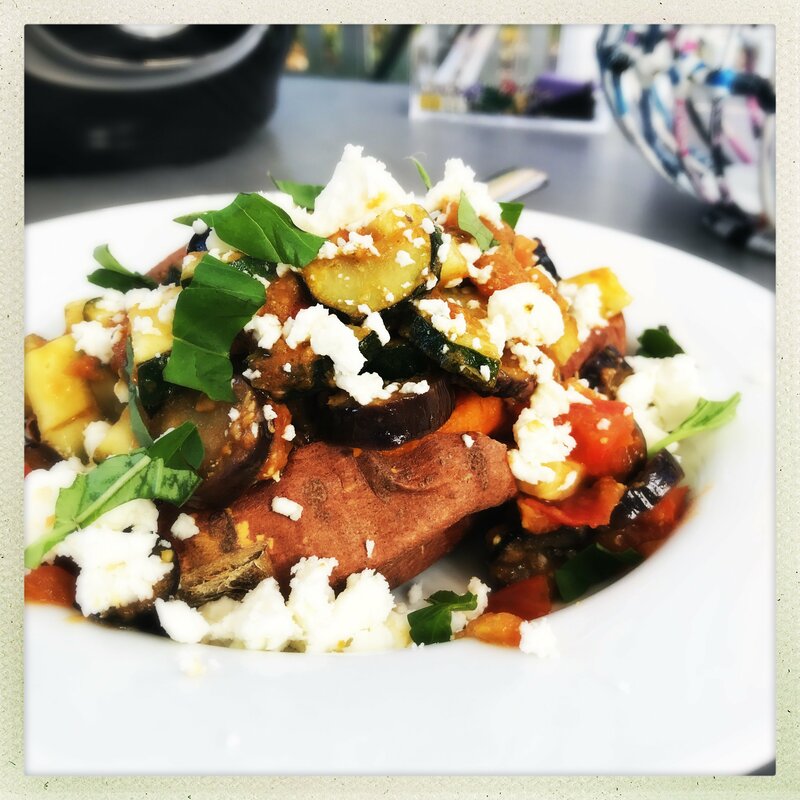 Just a matter of frying up your favourite med veg in a pan and stirring through the pesto. Easy huh?! Yummy vegetarian, healthy lunch choice. Heat the oven to 200C and line a baking tray with tin foil and place it on the shelf underneath where you'll be baking the sweet potatoes. Scrub the sweet potatoes and dry them well. Prick them a good few times with a fork then microwave on hight for around 5-6 minutes. Then put them straight into the hot oven to continue baking. Check the potatoes after around 30 minutes to see if they're soft enough, if not, just check them every 5-10 minutes until they're ready. Whilst the potatoes cook, mix up your pesto veggies filling. Add a splash of olive oil to a non stick pan, then tip in the courgettes, aubergines and tomatoes. Cook over a medium/high heat for around 10 minutes until all the veg is soft. Then remove from the heat and stir through the olives and pesto. 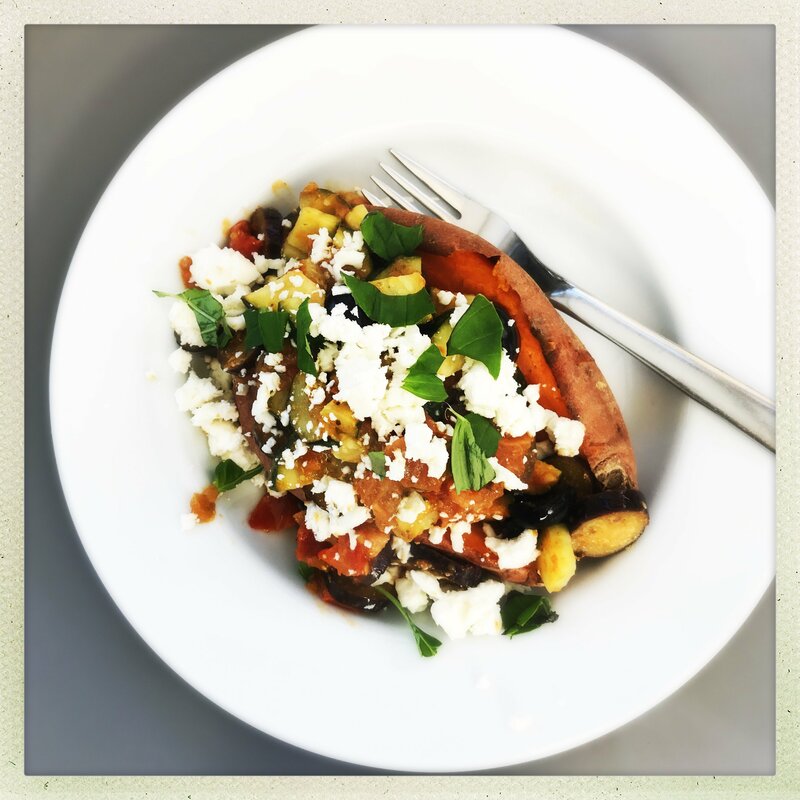 Split open the sweet potatoes, top with the pesto vegetables and sprinkle over the crumbled feta cheese. Go spicy and throw a chopped chilli in with the veggies. Fancy something sweet and sticky, add in a spoonful or caramelised onions instead of pesto. Switch the feta for mozzarella instead.